Purpose: Use this document as a reference for how to run the automated step increase process in ctcLink. This process automatically moves employees to the next salary step when they have completed the required time in the current step. 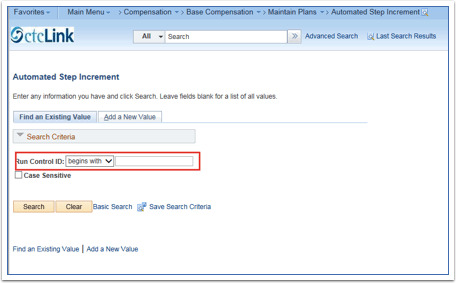 This process selects the employees that are eligible for a step increase and loads their records to a temporary table. 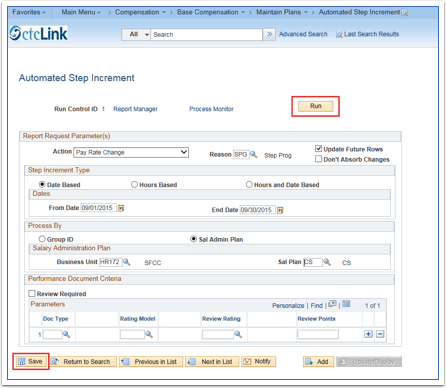 The system inserts a new job data row for employees who meet the data in the Hours or Months to Next Step increment fields. NOTE: The system only looks back 12 months from the last Step Entry Date. If the date is older than the 12 month look back period, a manual step increase will need to be processed. See Entering Pay Increases Using Steps QRG. On the Process Scheduler Request page, run process HR_CMP007 to select eligible employees. (Optional) Run SQR report CMP007 to review the data selected. Run application engine HR_SP_C1 to update Job Data pages for selected employees. NOTE: You can also run JOB007 (Automated Step Increase). This job runs steps 1 and 3 above. It does not run an SQR report for you to review the data selected.